André-Marie Ampère (January 20 1775 – June 10 1836), was a French physicist who first demonstrated that two current-carrying wires exert a force on one another, and worked out the mathematical expressions that account for this phenomenon. He was a Catholic and relied on his religious faith for strength through the many trials of his somewhat eccentric life. Ampère was born near Lyon, France, the son of Jeanne-Antoinette Desutieres-Sarcey and Jean-Jacques Ampère. As a child prodigy, he took a passionate delight in the pursuit of knowledge from his very infancy, and is reported to have worked out long arithmetical sums by means of pebbles and biscuit crumbs before he knew the figures. It is also said that he read the entire contents of an encyclopedia at a very early age. Inspired by the biblical story of the Tower of Babel, he also attempted to establish the proto-language from which all human tongues derive. His father began to teach him Latin, but ceased on discovering the boy's greater inclination and aptitude for mathematical studies. The young Ampère, however, soon resumed his Latin lessons, to enable him to master the works of Euler and Bernoulli. In later life, he was accustomed to say that he knew as much about mathematics when he was 18 as ever he knew; but, a polymath, his reading embraced nearly the whole round of knowledge — history, travels, poetry, philosophy, and the natural sciences. Ampere's father was executed during the French Revolution, creating a deeply disturbing, if temporary, effect on Ampere. In 1796, he met Julie Carron, and an attachment sprang up between them. In 1799, they were married. 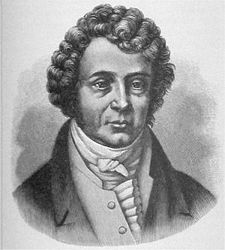 From about 1796, Ampère gave private lessons at Lyons in mathematics, chemistry, and languages; and in 1801, he removed to Bourg, as professor of physics, and chemistry, leaving his ailing wife and infant son (Jean Jacques Ampère) at Lyon. In 1802, Ampere published his first paper on probability theory, demonstrating clearly that the odds for a gambler increase with his wealth. In 1804, Ampere was appointed professor of mathematics at the lycée of Lyon. Ampere's wife died that same year, causing another emotional upheaval that took time to heal. On the day of his wife's death, Ampere wrote two verses from the Psalms, and the prayer, "O Lord, God of Mercy, unite me in Heaven with those whom you have permitted me to love on earth." Ampere married again in 1806, but the couple was legally separated in 1808, and Ampere was given custody of the one child of the marriage. Ampere's work Memoir on Probability attracted the attention of some of the important mathematicians of the day, and through it he obtained recommendations for the Lyon appointment, and afterwards (1804) a subordinate position as lecturer on mathematical anaysis in the polytechnic school at Paris, rising to professor of mathematics in 1809. He continued to pursue his scientific research and his diverse studies with unabated diligence. He was admitted as a member of the Institut National des Sciences in 1814, replacing Joseph Louis Lagrange, who had died that year. Ampère's fame mainly rests on the service that he rendered to science in establishing the relations between electricity and magnetism, and in developing the science of electromagnetism, or, as he called it, electrodynamics. On September 11, 1820 he heard of H. C. Ørsted's discovery that a magnetic needle is acted on by a voltaic current. Only a week later, on September 18, he presented a paper to the Academy containing a far more complete exposition of that and kindred phenomena. Ampere showed that two wire conductors running parallel to each other and carrying currents running in the same direction exert a force of attraction on each other. When the current of one of these wires is reversed, the two wire conductors exert a repulsive force. Along with his observations, Ampere developed a primitive galvanometer that could be used to measure the quantity of current passing through an electric circuit by measuring the magnetic forces generated between the current in the galvanometer and the current in the conductor to be tested. Because an electrical current could produce magnetic attraction, Ampere posited that all magnetic phenomena are electrical in nature, including those displayed by iron magnets and the earth. He proposed that the particles composing a magnet each have a closed circular circuit of electricty that creates a small magnet, the entire magnetic field of an iron magnet being composed of the total effect of each of these micromagnets. Ampere explored the new field of electromagnetism he helped establish with characteristic industry and care, and developed a mathematical theory which not only explained the electromagnetic phenomena already observed, but also predicted many new ones. In 1826, Ampere published a complete description of his theory, taking into consideration the efforts of other scientists since he first put forward his analysis in 1820. He was elected a member of the Royal Society of London in 1827. After several years of writing on electrical subjects, his attention turned to the organization of all the fields of knowledge, and he dedicated most of the rest of his life to this pursuit. This work did not profoundly affect the world of science the way his mathematical and experimental researches in electricity had. In the spring of 1836, he became ill on a trip from Paris to Marseille. His faith guided his life during this difficult time. He died at Marseille and is buried in the Cimetière de Montmartre, Paris. The great amiability and childlike simplicity of Ampère's character are well brought out in his Journal et correspondence (Paris, 1872). Ampere used to say that in his late teens, he came to realize there were three significant moments in his life, his First Communion, an exposure to the work Eulogy of Descartes and the storming of the Bastille. He was at times challenged in his faith, but would turn to the bible and the Fathers of the Church and Thomas a Kempis for inspiration and encouragement. Ampere was often dominated by his tendency toward abstract thinking, which distracted him from activities of everyday life. He once made off with the hat of an important personage without being conscious of it. He was nearsighted, but did not discover it until he borrowed someone's glasses, and realized how badly his vision was impaired. As a teacher, he tended to write overly large, partly due to an injury to his arm that he sustained while in his youth. His students more often than not amused themselves with his eccentricities rather than capturing the benefit of his lessons. In spite of his odd personality, Ampere's abilities superceded them, and his name has become a household word to anyone who has changed a fuse box or has read the specifications of an electrical appliance. Amps, or amperage, refer to the quantity of electricity that passes through a circuit in a unit of time. The ampere is a fundamental unit of electrical measurement. It is defined as the uniform electrical current that will sustain a force of 2x10 to the minus seven newtons per meter of length between two parallel conducting wires of infinite length and negligible cross section, spaced a meter apart in a vacuum. Bidwell, W.H., (ed.). 1856. "Men of Science." The Eclectic Magazine of Foreign Literature, Science and Art. 90-104. De La Rive, A. 1853. "Note relative to the Calculation of the mutual Action of Electric Currents." in A Treatise on Electricity in Theory and Practice. 2 Vols. London: Longman, Brown, Green and Longman. 546. Porter, Roy, and Marilyn Ogilvie, (eds.). 2000. The Biographical Dictionary of Scientists, 3rd ed. New York: Oxford University Press. ISBN 0195216636. Smedley, E., J. Rose, and H.J. Rose, (eds.). 1845. Encyclopaedia Metropolitana, or, Universal Dictionary of Knowledge. London: B. Fellows et al. 4:5. Williams, L. Pearce. 1970. "Ampère, André-Marie." in Dictionary of Scientific Biography. New York: Charles Scribner's Sons. 1:139-147. Museum of Ampere and Electricity In Poleymieux-au-Mont-d'or, near Lyon, France. This page was last modified on 20 March 2016, at 19:14.